Although most of us don’t have a closet like the one pictured (I know I don’t), your closet can still be functional. After all, your multi-used closet needs to be a sanctuary, not a place that causes you stress. By this time of year, most closets are a “hot mess” (a friend’s description for items that are in disarray). 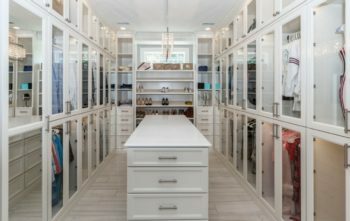 Before you add more clothing from post-holiday sales or spring clothing, it’s a great time to reorganize your closet and assess what you really need. Last fall, I wrote about cleaning out your closet. If you missed it or want a refresher, see the closet posts. If you did it last fall, great! Guess what? It’s time to do it again. In fact, I recommend that it be done seasonally which adds up to four times a year! If you need help to organize your closet, I can help. Not local? No worries! We can do it virtually. Email me or call 502-412-6444 today!